Some lessons are only learned from mistakes but, it’s much cheaper to learn from someone else’s mistakes than to have to do so from your own. Drawing on over fifty years of working with concrete structures, Robin Whittle examines the problems which he has seen occur and shows how they could have been avoided. The first and largest part of the book tells the stories of a number of cases where things have gone wrong with concrete structures. Each case is analyzed to identify its cause and how it might have been prevented. It then looks at how failures in structural modelling can lead to big problems if they are not identified before construction is undertaken. Beyond this it examines how contract arrangements can encourage or prevent problems in the designing and building processes. It concludes with an examination of the role research and development in preventing failures. By identifying the differences between shoddy economizations and genuine efficiency savings, this book offers savings in the short term which won’t be at the expense of a structure’s long-term performance. Invaluable reading if you’re designing or building concrete structures and want to avoid problems which could be expensive or embarrassing further down the line. Robin Whittle has over 50 years design and site experience of working with concrete structures. 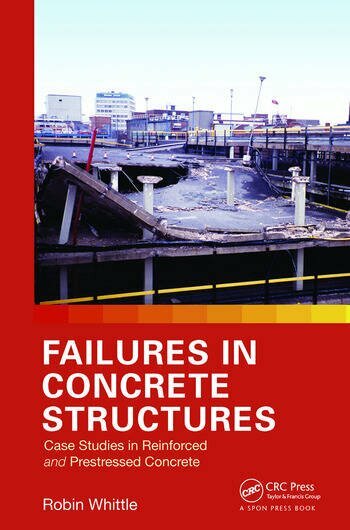 He is currently a consultant to the Arup Group ltd.
"With the need to learn from ‘near misses’ being one of the outcomes of the recent forensic engineering conference in London, this book offers a good start by providing a useful selection of failures as well as ‘near misses’ of concrete structures. The author’s undoubted expertise in design and construction with concrete, attained over half a century of working experience with a major consultant in the UK, is evident from the introduction right through to the end." "The book provides a fascinating insight into what can go wrong. It illustrates the importance of approaching problems from first principles and identifying the key load paths, loads, etc. This type of material rarely sees the light of day for reasons of litigation and commercial confidentiality." "This book is essential reading for any experienced engineer and offers insight into how designers and builders accidentally create structures that fail. This book both explains how things fall down and what was done or could have been done to overcome these errors. Learning from errors is an essential part of any engineer’s knowledge and expertise."